Some of the results from our research are transformed into stable and professionally managed services, that are used by the wider public. 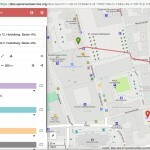 A prominent example is OpenRouteService.org. Since it’s introduction in early 2008 it has been transformed now to a rigorously tested rich API that is hosted on a cloud system and that can be integrated in other applications or used from the our web client. Yet, there are many further developments resulting from related research projects and activities. These may not yet be as ripe, thoroughly tested or well optimised as the main features provided through the core API at http://OpenRouteService.org. But still we feel that it is sensible to demonstrate those early results also on a web site dedicated to more experimental, early or research oriented ideas and features, or those for which we only have limited data or resources. 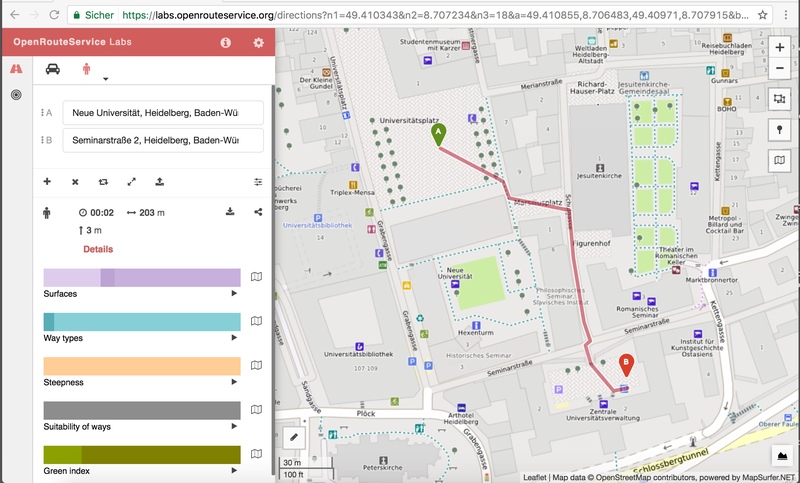 In contrast to the stable main page http://openrouteservice.org in the ORS Labs as a start you currently can find two specific new features, namely the POI locations search and “Open Space Routing“. The latter is available for pedestrian routing at the moment. Labs.openrouteservice.org does support prototype services restricted to Germany only. Based on your feedback and suggestions and as resources are available we are happy to improve those further. At some point when they meet our quality criteria we then can integrate them to the core OpenRouteService on the main site and also support global coverage. Routing usually relies on a road network. Open Spaces such as squares are areas where pedestrians are allowed to walk freely. They can be crossed in unlimited ways. 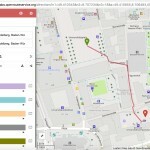 Therefore usually no (or only selected) routes are mapped in OpenStreetMap through these areas (modelled as closed ways). Therefore a routing system needs to generated virtual routes on those. We have evaluated several approaches in terms of quality and consequences for processing time and memory consumption and realised an improved algorithm that achieves some balance and compromise between those contradicting criteria. 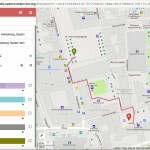 You can test the result for pedestrian routing including open areas explicitly labeled as squares in OSM at labs.openrouteservice.org for all of Germany. 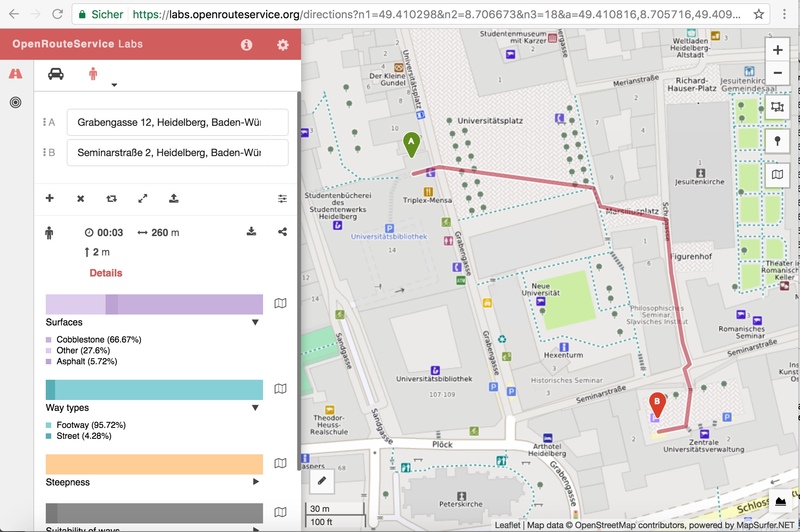 Further labs.openrouteservice.org gives a early preview to the forthcoming Places API through a first version of a query user interface for POI locations from OSM, that can be shown on the map. You can query POIs around a point or a line according to many categories. 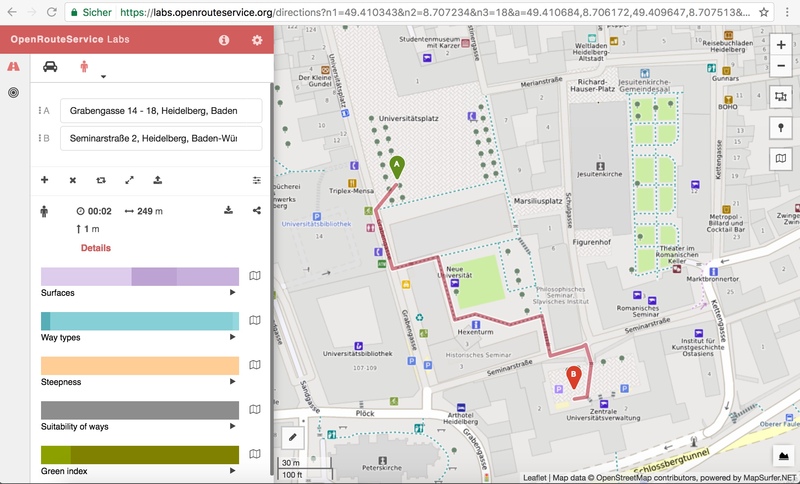 We are already working on further features for Labs.openrouteservice.org and will add them to the site soon (e.g. green routing). Stay tuned for future updates. Enjoy testing those experimental features and we are looking forward to further ideas and research cooperations. As a university and R&D innovation center (HeiGIT) we are always in search for new, interesting and challenging tasks and projects. 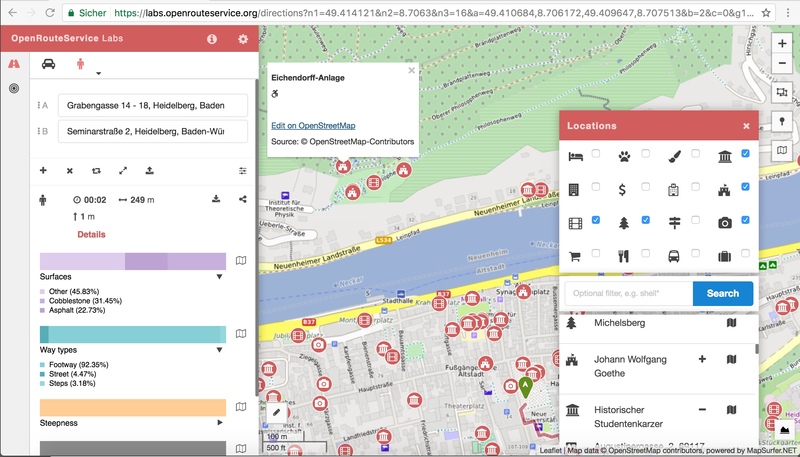 Several of these projects are related to mobility, routing and navigation as well as the analysis and improvement of user generated and free & open geographic information.